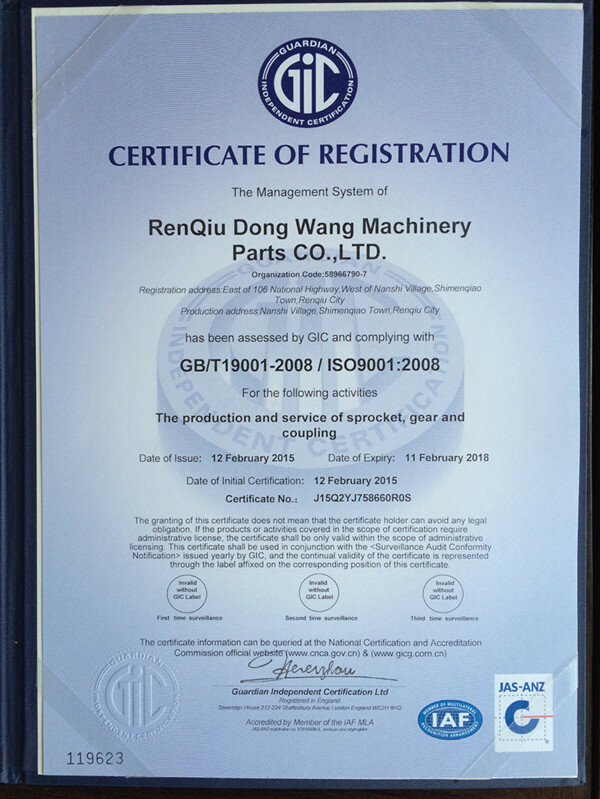 Company Overview - Renqiu Dong Wang Machinery Parts Co., Ltd.
6YRSRenqiu Dong Wang Machinery Parts Co., Ltd.
Renqiu Dongwang Machinery Co., Ltd. is a professional manufacturers engaged in production of standard sprocket (ASA, DIN, KANA). Gear,chain coupling and rack. We have established close trade relation with distributors from Malaysia, Thailand, Indonesia, South Korea, Russia, the USA and many other countries. Our company was founded in 2006 equipped with various types of sophisticated detection equipment and production equipment. After years of operation, we have formed a unique mode of production and management, and constantly develop new products and short cycle. Through the fast and stable development, we have become one of most experienced sprocket manufacturers in China, and have a good response to users at home and abroad. The production of high precision and long life of the product is always our top priority.Our main products are standard industrial sprocket, non-standard sprocket, coupling, gear, rack and other major series transmission products (in order to meet customer demand, we can produce according to the customer drawings, sample processing and manufacturing).If you trust us, please do not hesitate to contact us immediately, and we look forward to your inquiries.